The macaws are a flamboyant group of parrot species from Central and South America - with their bright colours they are amongst the most impressive of all tropical birds.The hyacinth macaw (Anodorhynchus hyacinthinus) is one of the most spectacular, both in size and colour. The vibrant ultramarine blue cannot fail to brighten any interior design, and the optional addition of hanging pegs makes it a useful key holder too. 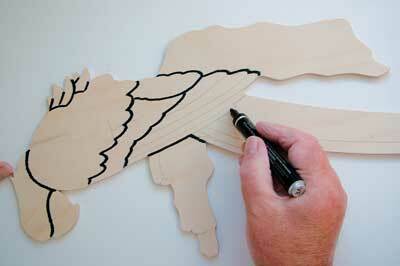 Enlarge the pattern to the size given, taping several sheets of paper together if necessary, and make six copies. Keep one copy for reference - you can write the numbers of the feather pieces on this to help identify them when all the pieces have been cut up. Note that the pattern falls into eight sections with different grain directions. Use the remaining five copies of the pattern to cut out these eight sections, leaving a border of approximately 10mm around each. 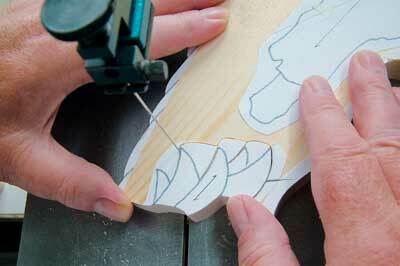 Arrange the patterns on your pine, aligning the grain-direction arrows with the wood grain. 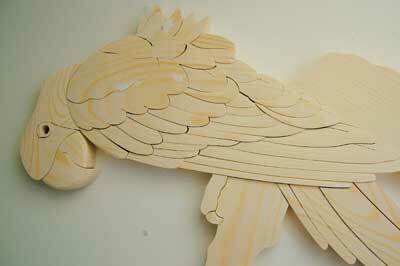 If possible, choose a straight-grained part for the long tail feathers, and a more curved grain for the top of the wing and head. 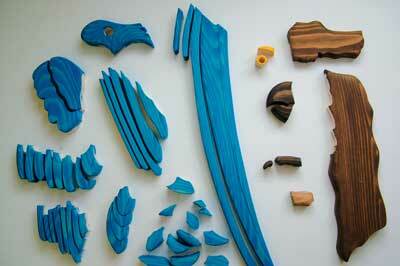 When happy with the layout of all the pieces, use a glue stick to fix each section firmly to the wood. 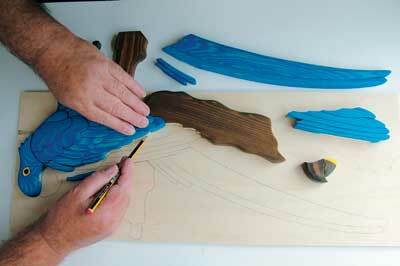 It's a good idea to cut the wood into pieces of manageable size before cutting round the detailed outlines. 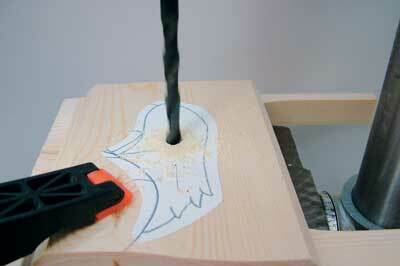 Before you cut out the head piece, drill the hole for the eye, using an 8mm bit in the pillar drill. 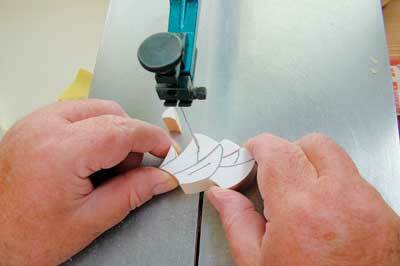 Fit the scrollsaw with a No.7 blade. It is important that the wood is flat and the blade straight and taut. Cut out the main body/wing piece first. De-burr this and every other piece after cutting with a piece of 120 grit sandpaper to ensure that all the pieces lie flat when they are assembled. 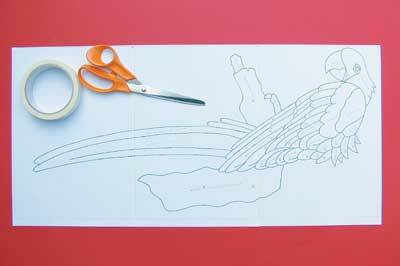 Lay the newly cut piece over the next piece to be cut - in this case the longer wing feathers - and if necessary retrace the cut line onto the new piece. Check the fit of these two pieces before moving on to the next one. ... then return to cut out the waste. When all eight sections have been cut out, put them together to check the fit, and mark with a pencil all the places where one piece meets another. 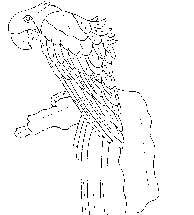 Next, cut up the eight sections into individual pieces, separating the feathers, the foot and claw, the eye, and the upper and lower parts of the beak. 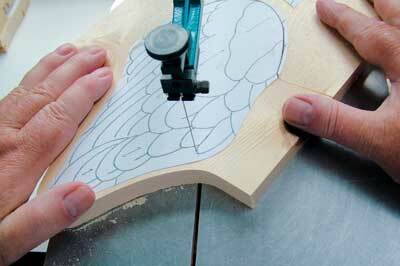 Mark the underside of each piece to ensure that you sand the right side. Number the feathers for easy location, and copy these numbers onto the sixth copy of the pattern for reference. Remove as much of the paper pattern as you can by hand - anything that is left will be easily sanded off at the next stage. Creating different levels of relief will give the macaw a 3D look. A disc sander fitted with an 80 grit sanding disc is great for rapid waste removal, but be careful - it's easy to take off too much, and you can't put it back on. 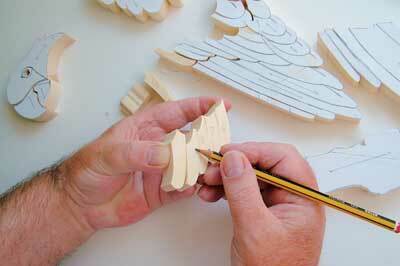 Start with the lowest pieces, which will be the branches - lower both of these by 5mm. 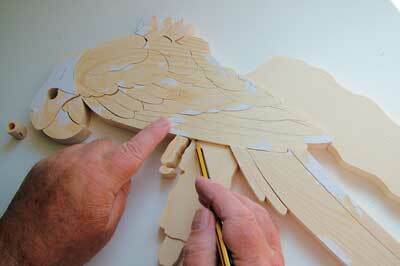 Mark the height of the branches on all adjacent pieces - claw, wing and tail feathers. Moving on to the claw, lower this by about 4mm. Next come the tail pieces, starting with the one closest to the smaller branch â€“ sand this down by 3.5mm, then lower the rest of the tail pieces by gradually decreasing amounts. The wing and body feathers will need very little sanding - some of the inner pieces will only need the paper pattern removed. Sand the head to approximately 1.5mm lower than the body. The drum and flexible-shaft sanders are very useful tools for rounding over the edges of the pieces, remembering always to sand with the grain to remove any imperfections left by the disc sander. 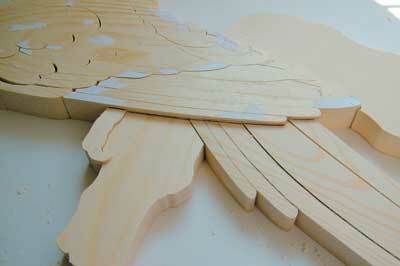 As with the rough sanding, start with the lowest pieces - the branches and tail. Redraw your height marks as you sand each piece, and remember not to sand below these marks. Also, be mindful of your pencil lines showing where one piece meets another. Don't be afraid to go back and sand a little more from the previous piece, but take care not to take off too much, especially on the central wing pieces. Sand little and often, replacing each piece back in position to check it. 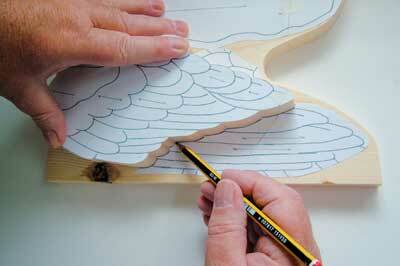 The edge feathers can be more strongly rounded - again mark the height and shape of each feather onto the next piece. Thin down the beak and round it over. 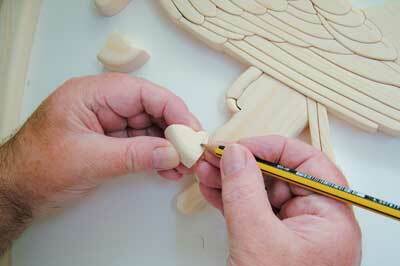 Place it back in position to mark the shape onto the head, then sand the head round and down to the line. 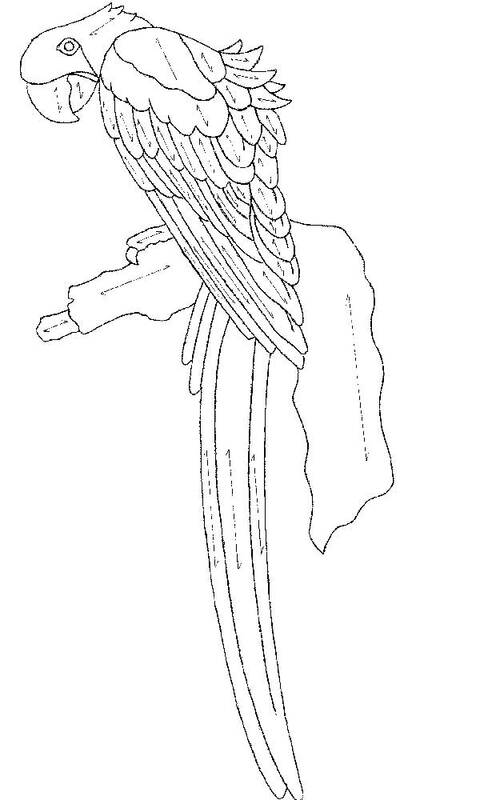 The yellow highlight is cut from the beak at this stage. Now sand all the pieces by hand. 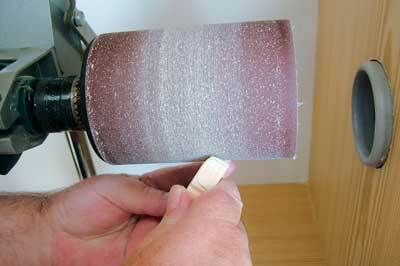 First use the sanding block with 120 to 180 grit paper to remove any scratches left by drum sanding. 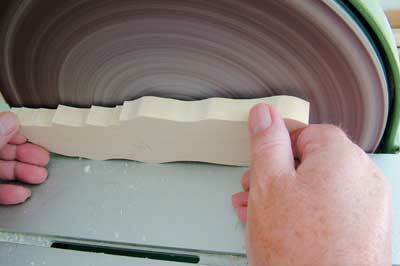 Then move on to a 220 grit paper, sanding and rounding over the edges of each piece in turn to a smooth finish. Finally, remove the dust from the pieces with a small, soft brush and a tack cloth. Sort the pieces by colour. Mix the colours and acrylic medium together, apply with an artist's brush, then remove any excess with a soft, lint-free cloth to reveal the wood grain beneath. Leave the pieces to dry thoroughly, then carefully denib them down with a very fine 320 grit sandpaper, again wiping away the fine dust with a tack cloth. 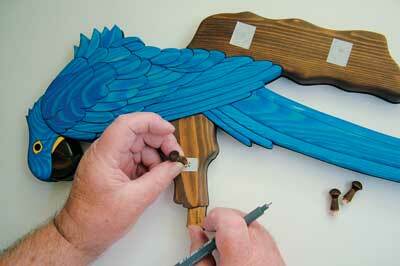 To finish, apply one or two coats of acrylic matt varnish to the entire macaw, except the three pieces of the beak, the claw, and the yellow part of the eye - use a satin varnish on these pieces to give them a soft sheen. Allow everything to dry overnight. Assemble all the pieces on the plywood backing sheet. Using a sharp pencil, trace around the whole outline first, then carefully remove one section at a time and mark around the adjoining pieces that are left until you have a detailed map of all the parts. Cut out the complete outline on the scrollsaw - as the piece is quite long, you may have to reverse the blade out and cut in from a different angle, depending on the throat size of the saw you are using. 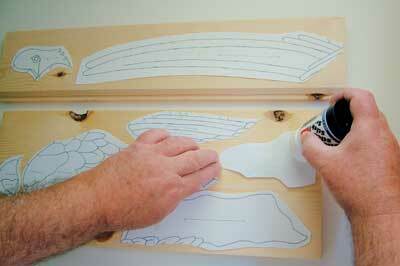 Apply a coat of sanding sealer to the reverse side. Go over your inner pencil lines with a thick black marker pen to disguise any slight gaps between the pieces, then apply black acrylic paint around the edges of the backing. When dry, sand the backing with 180 grit paper on a sanding block, and the edges with 320 grit. Wipe down with a tack cloth. 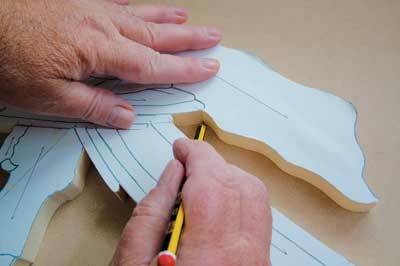 Place the backing on a flat surface and assemble the pieces onto the backing to check the fit. 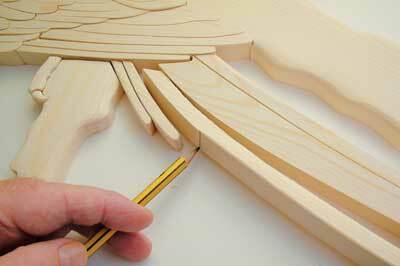 Apply glue to the underside of each piece in turn and glue into place - it should be enough to push the glued pieces firmly down without clamping. 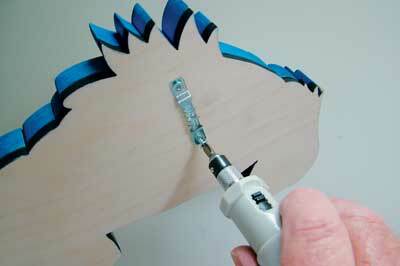 Wipe off surplus glue with an artist's brush or damp cloth. 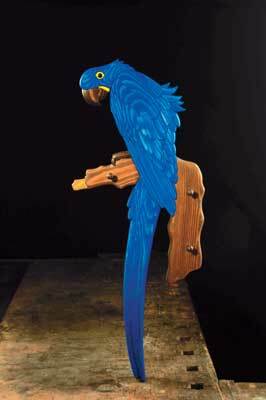 Hold up the macaw between your thumb and forefinger until it hangs the way you want, and mark the location for the saw-tooth hanger with a bradawl. 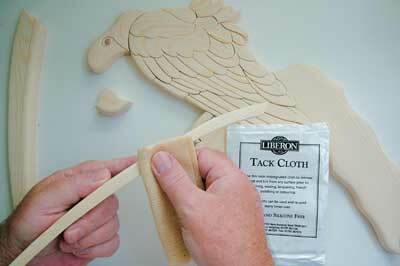 Lay the macaw face down on a soft cloth and fit the hanger using the small screws. 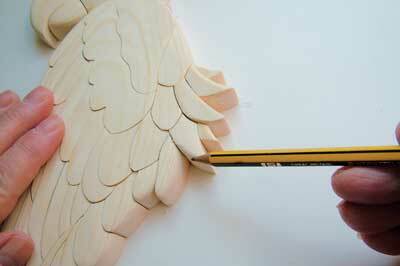 Stain and varnish the pegs to match the branches and allow to dry. Stick small pieces of masking tape on the three peg locations and mark a centre cross on each. Drill the holes just deep enough using a bit to match the pegs - in our case 6mm. 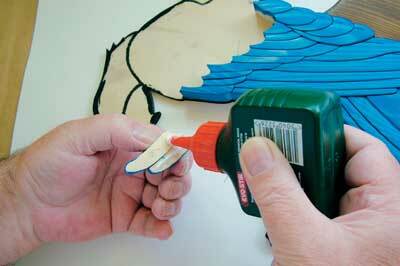 Remove the tape and clean out the holes if necessary before applying a small dab of glue to the end of each peg and gluing them into place.